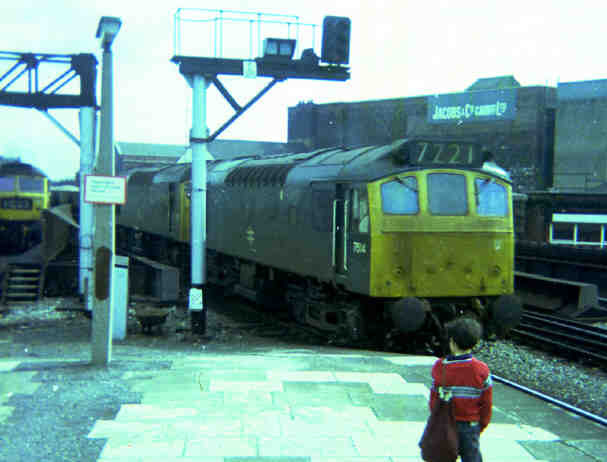 A pair of class 25's, D7515 and D5181, pass through Cardiff with an iron ore train. 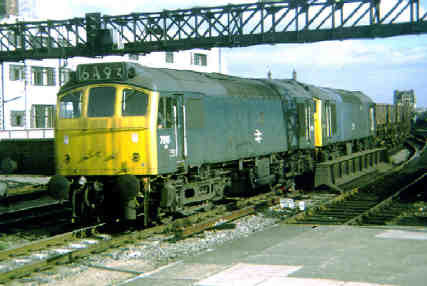 These locos were often used in pairs, driven by one driver, but they also worked single handed on turns similar to those covered by the Class 31's on the WR. When I was working at Newton Abbot station a driver was complaining about their lack of power, he'd had one to pilot a Western on a heavy train from Newton to Plymouth over the steep banks on this section. Trouble started when the signalman sent the train out on the Down Relief which meant the bottom of Dainton Bank was approached at 25 mph, the two locos struggled ever slower to the summit, scarcely making it - it turned out that the Western only had one of its two engines in gear !! D5181 again this time with D7502 at Radyr, a yard in the valleys near Cardiff. 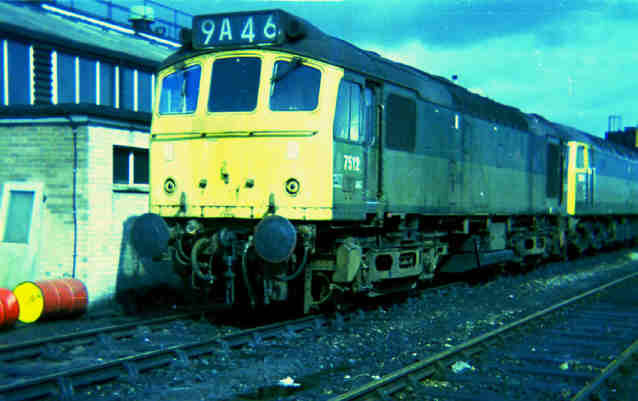 D7511 and a Class 47 light engine at Cardiff General. 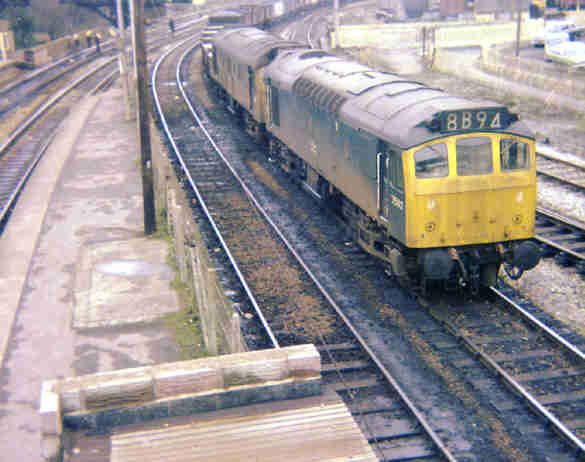 D7512 on shed at Severn Tunnel Junction was also in the company of a Class 47. 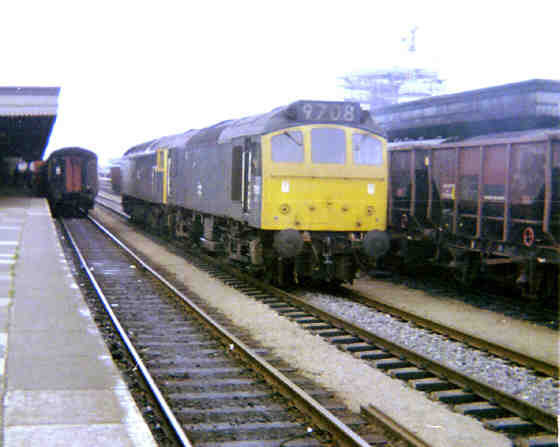 D7514 leads a class mate into Cardiff General on a train of hoppers. Photos by B Tucker. 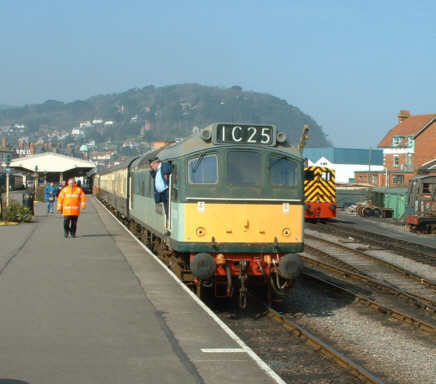 Several Class 25's have been preserved, this one on Western Region territory at Minehead on the West Somerset Railway is D7523.